Marijuana sales in the United States reached a record high in 2015. Legal in Alaska, Colorado, Oregon, Washington, and the District of Columbia, a whopping $3.4 billion of the green stuff was sold last year. The best way to give that figure some kind of perspective is by comparing it to the sales of well-known and established brands. Take Oreo for example, a cookie loved by millions of Americans. Between April 2014 and April 2015, its sales amounted to $711 million. Weed sales were five times higher than that. 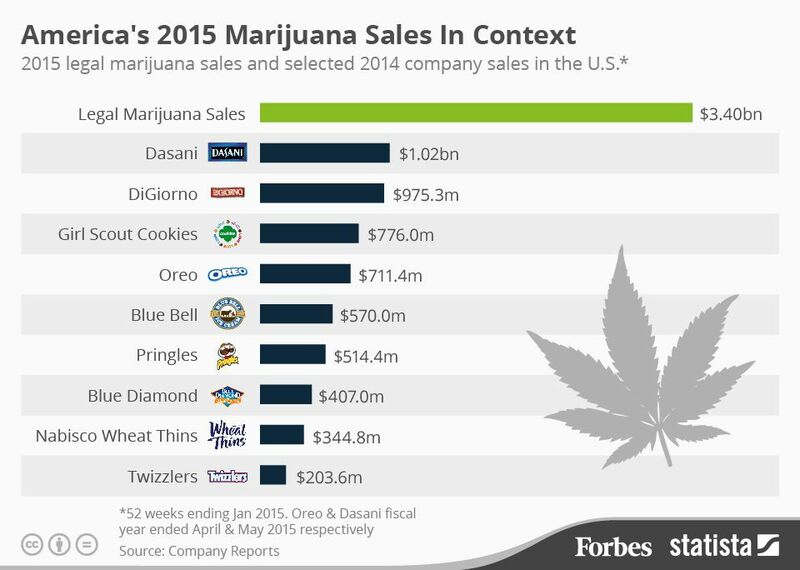 Dasani brand bottled water recorded impressive sales figures of $1.02 billion between May 2014 and 2015 but legal marijuana sales were still about three times higher last year. In 2016, America’s legal marijuana sales are expected to be even higher, somewhere in the region of $3.5 billion to $4.3 billion.